Rescue Aliens, available on both Android and iOS from the Apple App Store and Google Play, is a decent little game that has a surprising level of variety and is also completely free. The game is well designed, and has some nice graphics. A physics based puzzler, Rescue Aliens asks you to help guide a little group of cute aliens around levels. Each alien has a different power, and it is in combining these abilities that you will find the best way of solving each puzzle. ● 100’s of unique puzzle-arcade levels to play through! 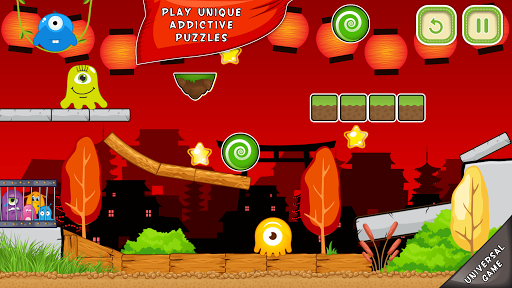 ● Fast, fresh gameplay w/ responsive controls – that keeps you entertained for hours! ● Engaging 3-Star level structure keeps you motivated to play! ● Universally compatible across all iOS devices! ● GameCenter leaderboard integration to let you compete against friends! ● Unlockable achievements to keep you motivated! ● Powerful, innovative physics-engine enabled gameplay! ● Full Retina HD display support! ● Diverse globetrotting level backdrops! ● Flexible settings options & user-friendly in-app store! The game has some great original music, a lot of achievements to unlock and hundreds of levels to find and beat, with stars to try to get on each stage. The game has Game Center online leaderboards, which are always welcome and there is an incredible amount of repeatability for a free game.